Anger is defined as “a strong feeling of annoyance, displeasure, or hostility.” This seems like a simple definition, but anger is not a simple emotion. It comes in many shapes and forms. What makes one person angry or annoyed may not even be noticed by another person. Anger can make us act and react in a number of ways, including saying or doing something we may not mean. It’s perfectly normal to get angry from time to time but feeling consistently angry can take a toll, both physically and emotionally. It can also take a toll on our relationships with friends and family. Module 9: Anger Management asks participants to consider what flips their switches, what triggers feelings and reactions of anger, and how they might positively deal with these emotions. Imagine a youth yelling, “That’s it! I’m leaving!” and slamming the door behind them. Now imagine what the youth, and the guardian, might have done to reduce the intensity of this scene. Anger management certainly is an important aspect of runaway prevention. In order to talk about ways to deal with anger, we must first define what anger is and what it looks like for different people. Anger is an emotional state that can range from mild irritation to intense fury and rage. Feelings of anger actually produce physical changes in the body, such as increased heart rate, blood pressure, and adrenaline. Some people notice changes in their bodies when they feel angry. For instance, one person may feel the tension in their muscles while another may get a stomachache. In the activity, “What Flips Your Switch?” youth can draw out what they look like when they get angry. Anger shows differently in everyone, so it can be helpful for youth to realize what happens to them emotionally and physically when they get upset and to start to think about how to cope in a healthy manner. It’s also important to recognize that sometimes anger can mask another emotion that may be harder to manage – such as disappointment, jealousy, frustration, or rejection. During this time participants can think about harmful ways they have dealt with anger in the past and how they may be able to create more positive coping mechanisms to keep themselves and others safe when they become upset. Each of us is unique in how we feel, express, and deal with anger. One great way to deal with anger is to relax. In the final activity, participants learn some relaxation techniques and how they can implement them into their lives when emotions are flaring. Most of the techniques focus on breathing or on helping reduce anxiety and tension. The idea is that anyone can do these at any time if they need some help calming down. When handled in a positive way, anger can help people stand up for themselves and fight injustices. It’s important for all people to recognize what their anger triggers may be and how they can positively deal with anger as it arises. 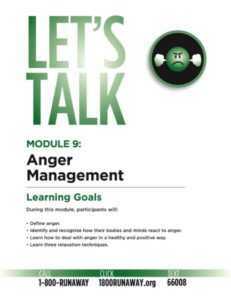 By utilizing some of the techniques discussed in Module 9, youth can start to deal with anger in a more positive way. Some people relax best by talking to someone about their feelings, so remember the National Runaway Safeline, available at 1-800-RUNAWAY or online at 1800RUNAWAY.org, is always here to listen and here to help.